HE the Chief of Staff of Qatar Armed Forces Lieutenant General (Pilot) Ghanem bin Shaheen al-Ghanem met with the Turkish Army's Chief of Staff General Yasar Guler in Ankara on Monday. The meeting dealt with a host of topics in addition to military co-operation between the armed forces of the two countries, the official QNA reported. 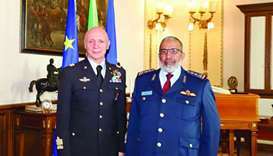 HE Lieutenant General (Pilot) al-Ghanem also met with Turkey's Minister of Defence Hulusi Akar in the presence of the Turkish Chief of Staff. Both meetings were attended by Qatar's ambassador to Turkey Salem bin Mubarak al-Shafi, Qatar's military attache in Ankara Brigadier Mohamed Rashid al-Shahwani and a number of senior officers from both countries' armed forces. HE the Chief of Staff also paid a visit to the Turkish Special Forces' headquarters.